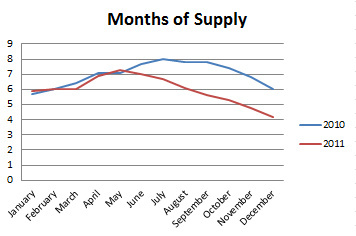 Months of supply (MOS) is a key indicator of the status and health of a real estate market. A market is considered balanced between buyers and sellers when there is roughly a 5 to 6-month supply of homes available for purchase. In Austin, there was very little difference between 2010 and 2011 for the first 5 months of the year, with the MOS being 7.1 and 7.3 in each year, respectively. While inventory continued to rise during June and July in 2010, it crested in May of 2011 and shrunk through the end of the year. Austin did not become a “balanced” market until December of 2010, but was balanced as early as August of 2011, even creeping towards a essentially a seller’s market by November and December 2011. The market started out right in 2012 with January coming in at only 4.2 MOS. I think that there are several factors for this change in 2011 and positive trending in 2012. The absence of unmotivated sellers, more available financing, and strong demand are a few key drivers. I would think that we would see the 2012 MOS numbers crest in July near 6.5 with the yearly average coming in around 5.7. Despite a soft national real estate market and strong lending restrictions, the Austin market is strong and should see incremental growth for the next few years.